This exhibit focuses on the current issues facing the National Parks Service and Baxter State Park, which hosts the northern terminus of the Appalachian Trail. While the National Parks service tends to advocate for the increasing awareness and use of its various parks and the multitude of benefits its users will experience, Baxter State Park in Maine has a different set of beliefs. Baxter State Park is a unique entity founded by former Maine Governor Percival Baxter with the mission to preserve the purity of the region's wilderness with the minimal intrusion of mankind. The park's mission does not include advocacy for maximizing usage of recreational areas, but rather sets strict limits on numbers of guests allowed at a time. 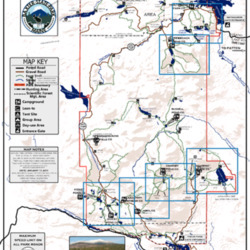 The prioritization of wilderness over people sets Baxter State Park apart from the National Parks Service and has led to issues when hikers along the Appalachian Trail who are unaware of or simply disregard the unusual restrictions and regulations of the park on their way to the northern terminus at Baxter Peak. The few miles of the Appalachian Trail that exist in the park are maintained by both the Maine Appalachian Trail Club and Baxter State Park employees. This exhibit will seek to examine the source of the fundamental ideological differences as an explanation for the more recent conflicts between Baxter State Park and Appalachian Trail hikers and the National Parks Service.